Proof(, and for the body of evidence, here’s the collection). 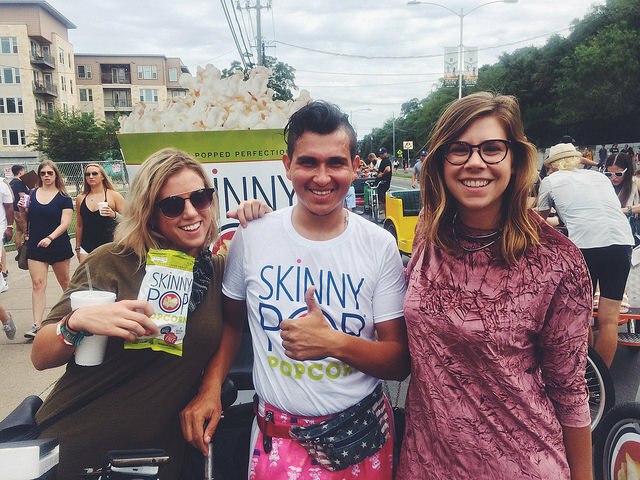 SkinnyPop Popcorn‘s third pedicab ad campaign with us, for Austin City Limits Music Festival 2016, was identical to those they ran in both SXSW 2016 and ACL 2015. Attached to the pedicab driver’s seatpost was another set of handlebars, which held open a custom-made pouch containing free popcorn bags for fares. The pedicab driver was “branded” and “for hire,” meaning they wore a campaign t-shirt and provided free rides. Their shifts were for 8 hours per festival day. Printed on the t-shirt, down the driver’s back, was @skinnypop’s social media handle, and the hashtag #skinnypoprides. 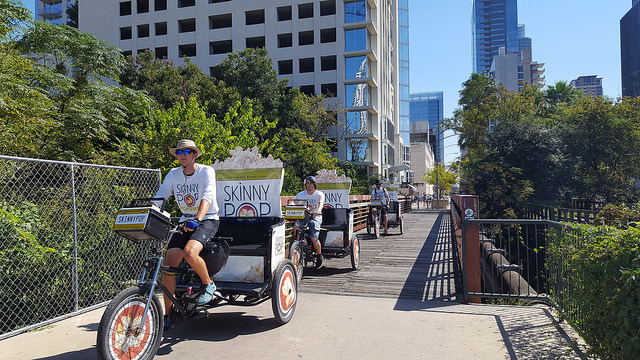 People loved these five pedicabs. Speaking to the pedicab drivers about their experiences afterward, the only way they could’ve been more popular is if a headliner had been with them.